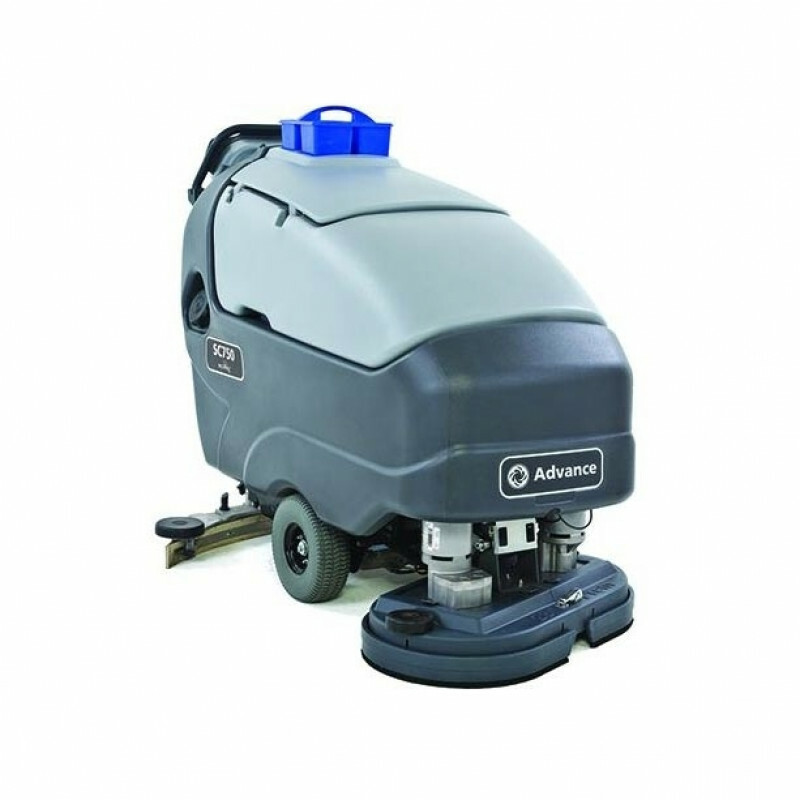 The SC750 is one of our Advance walk behind floor scrubbers that has a 28 inch scrubbing path for making quick work of cleaning your commercial floors. This Advance floor scrubber is rugged, low-maintenance, and efficient. Gray, non-marking solid tires deliver superior traction while propelling the unit forward at up to 3.6 mph during transport and 3.4 mph during scrubbing. This, paired with the 28 inch cleaning path, allow the unit to have an impressive cleaning rate of 41,900 ft² per hour. A 21 gallon solution tank and a 21 gallon recovery tank allow for up to 84 minutes of continuous scrubbing to offer high productivity thanks to not having to dump and refill as much. A self-adjusting splash skirt stops un-intended splashing that could lead to slips and falls of others around you. The gravity feed solution is controlled with the help of pulsating solenoid technology to properly maintain the dispersion of the liquid. Advance machines are made using Smart Solutions™ technologies to help save on labor costs, minimize environmental impact, minimize operator injury and fatigue, and reduce the total cost of ownership of commercial and industrial cleaning machines. This unit is also a good choice for daytime cleaning thanks to a low 61 dB the machine produces while scrubbing. The unit comes with a pair of 14 inch pad drivers, batteries, and a shelf charger and can fit any of our 14 inch pads like our red scrubbing pads or black stripping pads.